Lots of organization chart examples created by Edraw Organizational Chart Software. Included are police organizational chart, computer organizational chart etc. With Edraw Organizational Chart, you can create clear and comprehensive police organizational charts easily and quickly even as a novice user. As you can see by studying the sample organizational chart below, these types of charts are the ideal way to illustrate the inner structure and hierarchy of a business or any other type of organization. Nothing is left unclear when structural relationships are illustrated with an organizational chart created with Edraw - the ultimate organizational chart software. Use it to create organizational charts, visualize police organizational chart, police department organizational chart, information department organizational chart, army organization chart, military organization chart, company organizational chart, government organizational chart etc. 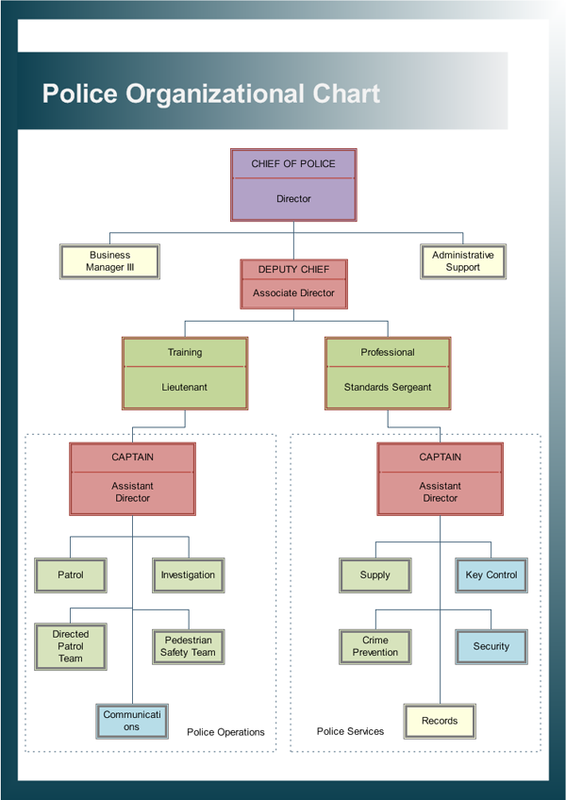 The following are some samples of police organizational charts.